If you are remodeling your kitchen or just your kitchen sink (and you haven't done so in many years or perhaps at all) you may be surprised to see the large variety of kitchen faucets that are currently available. There are multiple styles of course, but the surprising factor may be the variety of features that you can choose from. These are not your mother's kitchen faucets! But the question then is, how do you choose the right one? The first step is to choose the right kind of faucet. Faucets are not a "one size fits all" kind of thing. You need to not only get the right type of faucet (two handle vs. one handle) and (tall vs short) but you will need to choose the one that fits your sink. If you're not changing out your sink then you will want to count the number of holes in your sink when replacing the faucet. Don't forget to include (if you have them) a hole for the sprayer and another for the soap dispenser. The majority of sinks have 3 holes. One for the hot water, one for the cold water and one for the spout. So, if you're not changing the sink then you must select a faucet that has a separate hot and cold handle. That eliminates all the faucets with just one handle. A note on one handle faucets. If your kitchen faucet will be placed very close to a backsplash, consider how the handles move. If you have to move the handle away from you to turn the water on - it may hit against the backsplash and be rendered useless. So, we caution you to take that into consideration. 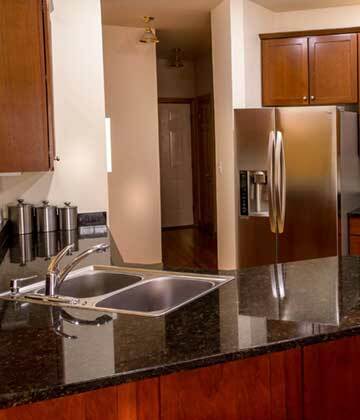 How Tall Should A Kitchen Faucet Be? The second step is to choose the right size. If your sink is under a window or a cabinet, you can't choose a very tall faucet because it simply won't fit. Also, if your sink faces your family room, you may not want a tall spout sticking up over the counter tops. But if you choose a spout that is too short and your sink is not very deep you will have a difficult time washing larger dishes as well as pots and pans. You also don't want to get a large faucet for a shallow sink because you will have a lot of splashing water coming back at you whenever you turn it on. How Do You Measure A Faucet For The Kitchen Sink? the depth of area the faucet will sit on (or you can measure the depth of your old faucet). I know - that heading may seem overwhelming. Fifty designs to choose from! But honestly, once you eliminate the ones that don't fit the type and size of faucets that you need you will have a much more manageable number to choose the right design for your kitchen. Here are images from Google on some of the most popular kitchen faucet designs available today. If you have any questions about kitchen faucets, call Atlantis Plumbing today at 770-505-8570. We are available 24 hours a day, 7 days a week.